Using reserved DB instances, you can reserve a DB instance for a one- or three-year term. Reserved DB instances provide you with a significant discount compared to on-demand DB instance pricing. Reserved DB instances are not physical instances, but rather a billing discount applied to the use of certain on-demand DB instances in your account. Discounts for reserved DB instances are tied to instance type and AWS Region. The general process for working with reserved DB instances is: First get information about available reserved DB instance offerings, then purchase a reserved DB instance offering, and finally get information about your existing reserved DB instances. When you purchase a reserved DB instance in Amazon RDS, you purchase a commitment to getting a discounted rate, on a specific DB instance type, for the duration of the reserved DB instance. To use an Amazon RDS reserved DB instance, you create a new DB instance just like you do for an on-demand instance. The new DB instance that you create must match the specifications of the reserved DB instance. If the specifications of the new DB instance match an existing reserved DB instance for your account, you are billed at the discounted rate offered for the reserved DB instance. Otherwise, the DB instance is billed at an on-demand rate. For more information about reserved DB instances, including pricing, see Amazon RDS Reserved Instances. Reserved DB instances are available in three varieties—No Upfront, Partial Upfront, and All Upfront—that let you optimize your Amazon RDS costs based on your expected usage. This option provides access to a reserved DB instance without requiring an upfront payment. Your No Upfront reserved DB instance bills a discounted hourly rate for every hour within the term, regardless of usage, and no upfront payment is required. This option is only available as a one-year reservation. This option requires a part of the reserved DB instance to be paid upfront. The remaining hours in the term are billed at a discounted hourly rate, regardless of usage. This option is the replacement for the previous Heavy Utilization option. Full payment is made at the start of the term, with no other costs incurred for the remainder of the term regardless of the number of hours used. If you are using consolidated billing, all the accounts in the organization are treated as one account. This means that all accounts in the organization can receive the hourly cost benefit of reserved DB instances that are purchased by any other account. 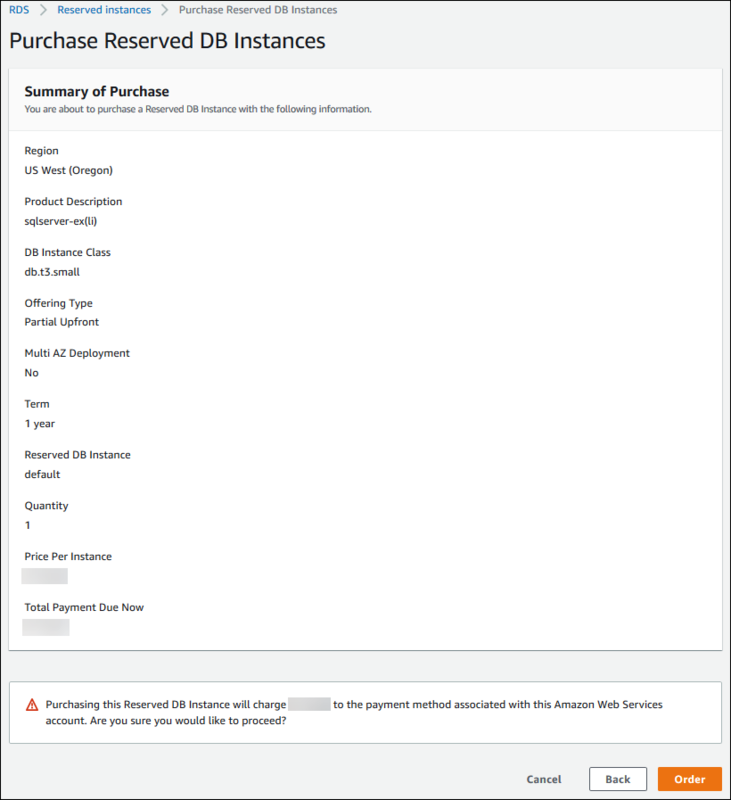 For more information about consolidated billing, see Amazon RDS Reserved DB Instances in the AWS Billing and Cost Management User Guide. When you purchase a reserved DB instance, one thing that you specify is the instance class, for example db.m4.large. For more information about instance classes, see Choosing the DB Instance Class. If you have a DB instance, and you need to scale it to larger capacity, your reserved DB instance is automatically applied to your scaled DB instance. That is, your reserved DB instances are automatically applied across all DB instance class sizes. 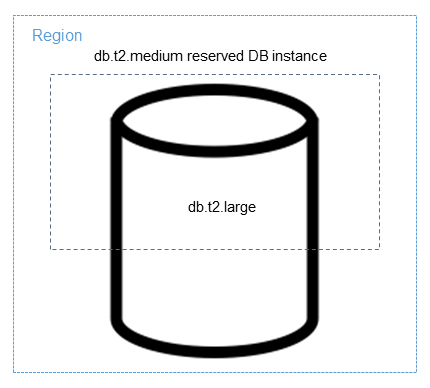 Size-flexible reserved DB instances are available for DB instances with the same AWS Region and database engine. Size-flexible reserved DB instances can only scale in their instance class type. For example, a reserved DB instance for a db.m4.large can apply to a db.m4.xlarge, but not to a db.m5.large, because db.m4 and db.m5 are different instance class types. 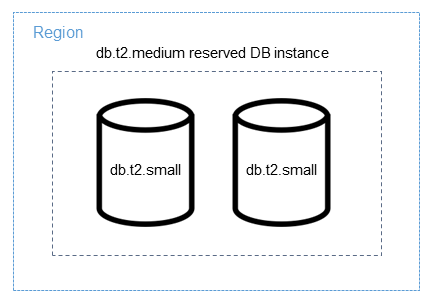 Reserved DB instance benefits also apply for both Multi-AZ and Single-AZ configurations. You can compare usage for different reserved DB instance sizes by using normalized units. For example, one unit of usage on two db.m3.large DB instances is equivalent to eight normalized units of usage on one db.m3.small. The following table shows the number of normalized units for each DB instance size. For example, suppose that you purchase a db.t2.medium reserved DB instance, and you have two running db.t2.small DB instances in your account in the same AWS Region. In this case, the billing benefit is applied in full to both instances. Alternatively, if you have one db.t2.large instance running in your account in the same AWS Region, the billing benefit is applied to 50 percent of the usage of the DB instance. Add all of these options ($90 + $45.60 + $19) with the reserved DB instance, and the total cost per month is $154.60. If you chose to use an on-demand DB instance instead of a reserved DB instance, an Amazon RDS MySQL Single-AZ db.r4.large DB instance class in US East (N. Virginia) costs $0.1386 per hour, or $101.18 per month. So, for an on-demand DB instance, add all of these options ($101.18 + $45.60 + $19), and the total cost per month is $165.78. The prices in this example are sample prices and might not match actual prices. For Amazon RDS pricing information, see the Amazon RDS product page. The terms for a reserved DB instance involve a one-year or three-year commitment. You can't cancel a reserved DB instance. However, you can delete a DB instance that is covered by a reserved DB instance discount. The process for deleting a DB instance that is covered by a reserved DB instance discount is the same as for any other DB instance. Your upfront payment for a reserved DB instance reserves the resources for your use. Because these resources are reserved for you, you are billed for the resources regardless of whether you use them. If you delete a DB instance that is covered by a reserved DB instance discount, you can launch another DB instance with compatible specifications. In this case, you continue to get the discounted rate during the reservation term (one or three years). You can use the AWS Management Console to work with reserved DB instances as shown in the following procedures. In the navigation pane, choose Reserved instances. Choose Purchase Reserved DB Instance. For Product description, choose the DB engine and licensing type. For DB instance class, choose the DB instance class. For Multi-AZ deployment, choose whether you want a Multi-AZ deployment. For Term, choose the length of time you want the DB instance reserved. For Offering type, choose the offering type. After you select the offering type, you can see the pricing information. Choose Cancel to avoid purchasing the reserved DB instance and incurring any charges. After you have information about the available reserved DB instance offerings, you can use the information to purchase an offering as shown in the following procedure. After you choose the offering type, you can see the pricing information, as shown following. (Optional) You can assign your own identifier to the reserved DB instances that you purchase to help you track them. For Reserved Id, type an identifier for your reserved DB instance. The Purchase Reserved DB Instance dialog box appears, with a summary of the reserved DB instance attributes that you've selected and the payment due, as shown following. On the confirmation page, review your reserved DB instance. If the information is correct, choose Purchase to purchase the reserved DB instance. Alternatively, choose Back to edit your reserved DB instance. After you have purchased reserved DB instances, you can get information about your reserved DB instances as shown in the following procedure. The reserved DB instances for your account appear. To see detailed information about a particular reserved DB instance, choose that instance in the list. You can then see detailed information about that instance in the detail pane at the bottom of the console. You can use the AWS CLI to work with reserved DB instances as shown in the following examples. To get information about available reserved DB instance offerings, call the AWS CLI command describe-reserved-db-instances-offerings. 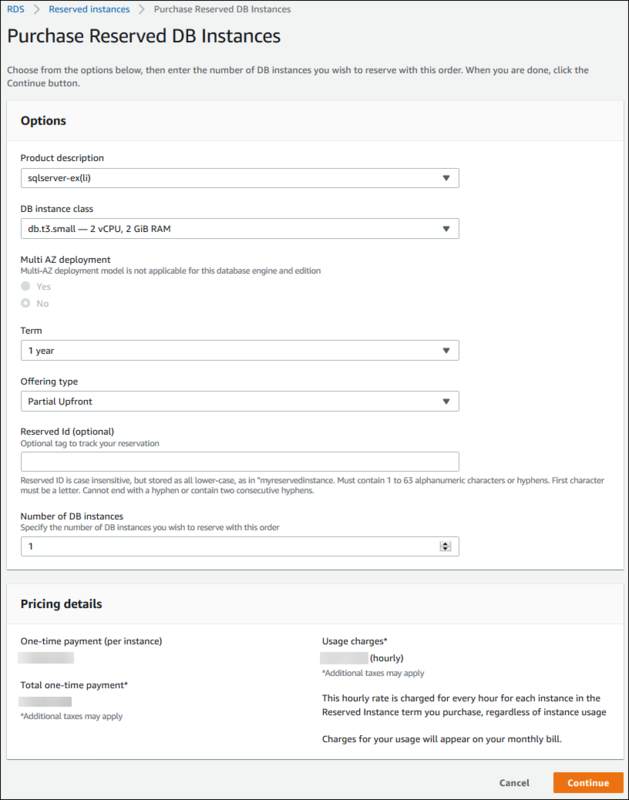 After you have information about the available reserved DB instance offerings, you can use the information to purchase an offering as shown in the following example. --reserved-db-instances-offering-id – the id of the offering that you want to purchase. See the preceding example to get the offering ID. --reserved-db-instance-id – you can assign your own identifier to the reserved DB instances that you purchase to help you track them. The following example purchases the reserved DB instance offering with ID 649fd0c8-cf6d-47a0-bfa6-060f8e75e95f, and assigns the identifier of MyReservation. After you have purchased reserved DB instances, you can get information about your reserved DB instances as shown in the following example. To get information about reserved DB instances for your AWS account, call the AWS CLI command describe-reserved-db-instances. You can use the RDS API to work with reserved DB instances as shown in the following examples. To get information about available reserved DB instance offerings, call the Amazon RDS API function DescribeReservedDBInstancesOfferings. To get information about reserved DB instances for your AWS account, call the Amazon RDS API action DescribeReservedDBInstances.